Curious about where I played during the trip? Here’s the list. 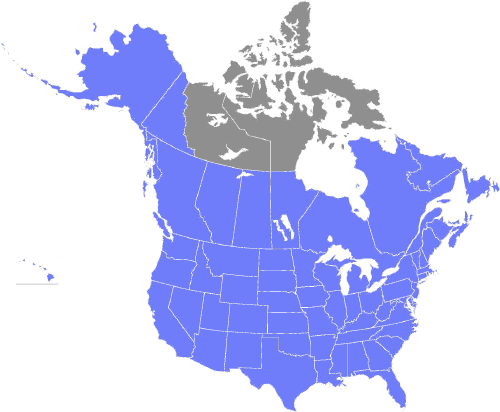 Key: States/provinces/territories that I visited on this trip are blue, and territories I did not visit are gray. Locations are listed in chronological order. Here we go! Late-night game; got done around 12:30 a.m.
Lots of 18-year-olds. Other goalie had the same mask as me. Had to sweet-talk my way into a spot. Some of the guys had never played before. I was the only goalie. Lopsided teams. Nice locker room. Got paid $10. Great session. Mostly adults, 18 or so to 30ish. A few other goalies. Some of the skaters worked with me on drills, taking good shots. I’d played at this arena back when I lived in California, so I knew to call ahead of time, very early in the morning, to reserve a goalie spot. I was successful. Other goalie refused to switch ends. Met a shift manager at the Bellagio (Trevor). Followed this up with being a hockey goalie busker in downtown Las Vegas, during which I made $20. Lots of ASU players. 4 goalies. Got paid $10. I was the only goalie. There were three skaters, two young guys and one old guy. Thanks to Tyler’s dad, I have actual photos to document this session! I was the only goalie. About 10 skaters showed up, mostly kids. We played half-ice. At the start of the session, there were two goalies and two skaters. By the end, there were two goalies and three skaters. The skaters were kind enough to work with us goalies on drills. The arena was really nice, and it had a great view of the mountains from the ice. Good skate. Felt like about C2 speed. Recorded on my Flip — here’s me making a save during this session. Three goalies. Two full benches. Skill level was generally high. One of the skaters was wearing a Goalcrease jersey and looked familiar, but I didn’t get around to asking his name. One of the skaters was wearing jean shorts instead of breezers — that’s hard-core. Four goalies showed up, but then one decided to skate out. Including him, there were three skaters. A new high in the goalie:skater ratio. Needless to say, we worked on drills instead of playing a game. Everybody else appeared to be undergrad students, so I was the oldest by far. The skaters were all quite skilled. Good turnout, good guys. About eight adults and a half-dozen kids. About 15 minutes into the session, it turned into a half-ice 3v3 game, which was fun. Nominally a drop-in, but it was just me and three skaters. Got some good ice-level video with the Flip. A true 5v5 drop-in game, plus a few on the bench. Good hockey. One of the most fun drop-in games I’ve played on this trip. Four goalies showed up, including one who seemed to be more accustomed to playing roller (he wasn’t shuffling at all, and he seemed to be unfamiliar with how far he’d slide on ice). True drop-in game. Three goalies, including one septuagenarian. Several minor-pro players. Many engineers, many transplants, and a surprising number of people who grew up in Alabama. Three goalies. Two full benches. Lots of Predators fans among them, for obvious reasons. Left after 90 minutes, but according to one of the goalies, the session usually lasts “until they kick us off the ice,” which apparently can be over three hours from the start. That would be quite a lot of pick-up hockey. Phil saw one of my early stories on Reddit and invited me to play with his team. Great group of guys on the team. The normal goalie skated out to let me play net. Unfortunately, I made some errors, and we ended up losing. 🙁 Still a lot of fun, though. Three goalies. Good skate. In contrast to my sub-goalie-ing in Louisville, I was making lots of great stops at this session. I was the only goalie at the start of the 2-hour session, but half way through, one of the skaters borrowed a set of goalie pads and stepped into the net for the first time in her (yes, her) life. Good skate, very friendly. Lots of interest in the trip from the arena staff and the other players. Fun skate. A former NHLer was there, skating down to our level, of course. Faced lots of breakaways, even by drop-in standards. Light attendance, but two goalies plus enough skaters for 4v4. Nice rink. Recorded video of the session from a different angle than normal: slightly behind the net. I seem to be moving quicker than I have in the past. Matt from the GSBB hooked me up with a spot tending goal for his team. It was a bit faster game than I’m used to, but it was great fun. I think I was pretty solid overall. Unfortunately, my lack of breakaway-stopping skill showed; we lost 5-1. Great team camaraderie. Went to the Sunday evening group goalie clinic run by McGuire Goaltending. It was good to give my game a tuneup. One of the kids there, also a student, was playing without a hand on his glove side; impressive. Same rink as the clinic, different day. Steve saw the Puck Daddy post about the trip and offered to skate out in order for me to tend goal for his Tuesday-night team. It was fun. Great group of guys. Also, we won! 7-3. Found out about this rink from Vimal, a student at nearby Concordia University. Fun skate, albeit a bit lopsided. I was the only goalie, so I switched sides every 10 minutes or so. First time I have had to pay for a drop-in game on this trip ($7). Served as a goalie for a women’s hockey clinic. The first half hour was drills and the final hour was a scrimmage. I’m counting this one as a drop-in even though it doesn’t fit perfectly. Found out about this from Steph, who was one of the women skaters there. Huge range of skill levels, but still fun. This privately pick-up game was organized by Cosmin, a researcher who moved to Canada from Romania over a decade ago. Cosmin was going to play goalie, but he gave up his net to allow me to check New Brunswick off my list. Held on Canadian Thanksgiving. Wes worked hard to find me this game. In spite of my team having only a guy or two on the bench for most of the game, we held in there against the much better staffed opposition for the first 20 minutes. I was making decent saves, and my D-men were coming to the rescue when I let out some risky rebounds. The last 30 minutes of the game, my team ran out of steam, and we got walloped. We lost. Unfortunately, only five skaters and I showed up. I took shots for a while, and then the skaters organized into a sort of rotating 3 v. 2 game, full ice. All of the guys were friendly, and four of them were from Newfoundland itself. I was by far the youngest guy on the ice. Todd, with whose group I will be playing a pickup game later, helps coach a junior high hockey team. They have only one goalie on the team, so Todd invited me to come to a practice and fill the other net. It was fun and humbling — those kids got more pucks past me than I’d like to admit! David put me in touch with Todd (mentioned above), who runs a weekly private game. It was a great group of guys and a lot of fun. A photojournalist from CTV News was at the game getting shots for a segment on my trip. Todd gave me a souvenir Sackville Flyers jersey. David also put me in touch with Sandy, who, like Todd, runs a weekly private game. In this case, it’s been more or less the same group of guys getting together to play hockey for the past 25 years. Wide range of backgrounds and skill levels, but they all knew how to have fun. One of the guys, Doug, was an orthopedic surgeon and had done knee replacements on several of the other players. Never know who you’ll meet playing hockey, eh? Todd (from Halifax) put me in contact with Bob, who connected me with a group that’s been skating together for many years. It was a fun game. They even sprung for a ref. Three goalies; the two regulars and I rotated every few minutes. Bob had medals made commemorating the trip and my visit; unfortunately, Bob himself could not be there due to a business trip to China. Fun atmosphere before and after the game, too. A group of Pikes from the UVM chapter rented a block of ice time for some pond hockey. Just a handful of guys showed up, but it was fun and relaxed. I started as the only goalie, but then another netminder showed up about 15 minutes into the session. There were plenty of skaters present. I think I was the only one on the ice who wasn’t an undergraduate student. The rink itself was amazing. I think it was the nicest arena I have played in on this trip, perhaps ever. Hat tip to Scot, who informed Phillips Academy that I was in the area. Phillips Academy invited me to their lunchtime skate. There was a good group of people present. I was having issues with my skates, and I also had to deal with a cut toe-tie lace, but I still made some saves. There were lots of goals, too. Also, I mispronounced “self-deprecating.” Still fun! Wide range of skill levels at the skate. Some old guys, some guys around 30, some undergrads from URI, some high schoolers skipping school, and an eighth-grader also skipping school (his father was at the skate, too). Three goalies. Two hours. Was getting pretty tired at the end. Though nearly foiled by the surprise news that goalies needed to pre-register for the session, I did not have another Calgary moment. Instead, one of the registered goalies, Bill, took pity on me and my story and gave me his spot for a little while. Including warm-ups, I spent about 20 minutes on the ice. The criteria were satisfied: I played goal on ice, and I made several saves. Large windows flanked the rink, which was set on a pier into the Hudson. I was the only goalie for the first 15 minutes, but then another guy showed up. Rather lopsided skate. I found it tremendously difficult to concentrate. Also, I was having issues with my skates again. I think my left skate got flat-spotted when it was sharpened in New Hampshire. Just me and, depending on the time, two to six skaters. Played 3v3 for a while, took shots for a while, and played 1v1 (plus me) for the last half hour when there were only two skaters left. Very relaxed skate. Was a good opportunity to regroup after feeling pretty exhausted for the past few weeks. Got paid $10. About nine skaters and I occupied the ice, giving us enough manpower for some half-sheet 4v4. It was really hard to track the teams, as the split was basically black versus navy blue. I let in a few strong-side goals that I really should have stopped, but overall I was satisfied with my play. Very fun skate. Two goalies, eight skaters. I was in the zone; it was partial redemption for some of my earlier disasters. Just enough for a 4v4 game. The other goalie seemed to be new to the position. Why do I say that? Well, his motions on the ice for one, but the dead giveaway was that he was wearing player’s skates. Even though DC isn’t a state, I couldn’t pass up the chance to skate at its only full-time ice arena. The coach of the team was generous enough to let me participate in the team’s practice even though they already had two goalies. That’s right: Hawaii has ice hockey. There’s only one rink in the state, so that’s where I went to play some drop-in. Good turnout; about eight skaters per side and two goalies. Wide range in skill levels. Surprisingly, not all of the players were transplants from the mainland; there were a handful of Hawaiians playing, too. My Virginia stop was down to either the Kettler Captials Iceplex in Arlington or this rink. Due to my staying in Williamsburg, the Hampton Roads Ice Plex won. As an aside, I find it interesting how some rinks style it “iceplex” while others use two words: “ice plex.” Two goalies and about sixteen skaters. Contrary to the reviews on Google, this rink wasn’t all that bad. I mean, it wasn’t great, but the ice was OK. The arena wasn’t too hot, which was good; some arenas feel like saunas. Remember how I was talking about the North Carolina rink being nice and cold? Well, the rink in South Carolina was oppressively hot. I swear I felt hot air blowing down onto the ice. Anyhow, it was a so-so session. I found myself sometimes getting ahead of the play, and other times getting behind the play. One of the guys at the session was wearing a Mooseheads sweater, which was a neat reminder of Halifax. The other goalie appeared to be about the same age as me, but the skaters — about 24 in total — were junior hockey players between the ages of 18 and 20. Most of them played for the Atlanta Knights. It was a rather fast game. Great turnout: about 24 skaters and 4 goalies. There were 3 additional goalies who showed up, for a total of 7, but they were turned away. One stuck around anyway and hopped on the ice in the last 20 minutes of the session when one of the original 4 goalies left. No shortage of goalies in northern Florida. Might have something to do with this rink being the only full time rink for over 85 miles in any direction. Mississippi was going to be a challenge due to the small number of rinks in the state, but fortunately Roy caught wind of my trip and invited me to fill a net in Biloxi at the icy home of the SPHL’s Surge. There were 14 skaters and 2 goalies at the skate, with talents ranging from “beginner” to “really great.” About half of the people were from the North, but that meant about half were from the South, which was great. One of the more organized stick-and-pucks I’ve been to. The rink was separated using bumpers. One-third of the rink was for the little kids (squirts and mites) and the remainder of the rink was for the bigger kids and kids at heart. Our section even had a coach who was running drills for everybody. I’m not sure if he was an official part of the stick-and-puck, and the drills were more for the benefit of the skaters than the goalies, but it was still a nice touch. A private drop-in game, organized by Bob. My fraternity brother Josh plays hockey in Houston and connected me with Bob’s group. Two full benches. Went down for a shot when I should have stayed up, took the puck in the dangler, and watched the dangler shatter into a dozen pieces. Fun, low-key game. Several good skaters were there, including a young guy from Canada and another young guy who wanted to play in Canada. Lots of hockey! About 2:45, in fact. I played two league games, thanks to Todd of the Ozark Hockey League, and when I was getting ready to leave the ice after the second game, the guys from the drop-in session asked me to stay around. My play was awful during the first league game, was better during the second league game, and was pretty hot by the drop-in. About 16 skaters and 3 goalies. Two hours of ice time. Wide range of skill levels and abilities represented, but generally pretty decent. About half a dozen guys from the KU club team were there. The dressing room was carpeted, which was a rare treat. Well-attended session. Kids and adults, wide spread of ages. My friend Blake coaches a bantam hockey team, and many of his team’s players were there as sort of an informal practice. Blake, too. About 18 skaters and 2 goalies. This might sound silly, but the other goalie was rocking a really nice pad setup. Very stylish. Yes, you make more saves when you look sharp. Organized by Erik, who learned about my trip from Puck Daddy. Fast skate; I was in over my head. Still a lot of fun, and while there were numerous missed saves, there were a decent number of successful saves, too. Excellent ice — nice and hard. The Minnesota Wild front-office staff invited me to play at their employee pickup game. I had never played at the Xcel Center, and it seemed like the perfect place to wrap up the trip in Minnesota. The guys were great, the media was there to document everything, and I had a wonderful time. What a way to end the adventure! When you get to Boston, drop a line, I can pass along info for a p/u skate almost any night of the week. When you make it to Virginia come down to Yorktown and play at the Iceplex! Great concept and nice website. Keep it going and when you get to Boston, feel free to write me as well. Usually play hockeytown in Saugus on Route One in the mornings from 10am-1pm, M-F, but I know of plenty of other skates you could get into. if you ever thought of trying to play in mississippi, it might be a bit of a problem…we don’t have much ice down here but there are two spots where it is possible…also, I noticed you were a pike! phi phi k a from the gamma theta chapter at mississippi state! (I play on the hockey team here btw so throw an email my way and I’ll try to help you as much as I can). If you come to Pennsylvania, and you go to Twin Ponds East in Harrisburg, a good time to come to there for a good crowd for open hockey is either Friday nights before the high school leagues start up, Saturday nights as you get closer to winter, or a weekday when there is a holiday for school (like Columbus Day). Would be cool if Twin Ponds East is a stop you make on your trip, plus there is the Hershey Bears who play not too far away as well. @will walker Yeah, Mississippi is sorely lacking in the ice department. However, I was pleasantly surprised to see that a new dedicated ice arena was just built in Olive Branch. Hockey’s making inroads! I wish I saw this before now… I could have hooked you up with a game in Windsor, Ontario last night! Delaware has 4 rinks in Newark in a one square mile area. Plenty of pick-up hockey at The Pond Ice Arena but if you want to play a game get in touch with me.